Augustin Barrier joined LALIVE in 2016. His main area of practice is international arbitration, including commercial and investment treaty arbitration in a wide array of business sectors including construction, oil & gas, mining, joint-venture, supply and distribution and foreign investments. He has acted as counsel in numerous international arbitral proceedings under the aegis of various institutions (ICC, LCIA, SCC, NAI, CCJA, ICSID) as well as ad hoc proceedings governed by a range of substantive and procedural laws, both common and civil law, such as French, Swiss, Swedish, English and international law. 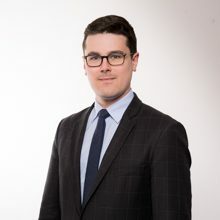 Mr Barrier is a member of several professional associations, including the Young Arbitrators Forum of the ICC (YAF), the Young International Arbitration Group of the LCIA (YIAG), CFA-40, Young ICCA and ASA below 40. Before joining LALIVE, Mr Barrier practiced international arbitration at leading international firms in Paris, where he also practiced commercial and white-collar crime litigation. Mr Barrier holds a Licence de droit from the University of Paris I Panthéon-Sorbonne, Masters degrees in Economic Law from Sciences Po Paris and in Litigation, Arbitration & ADR from the University Paris II Panthéon-Assas.